It’s getting late. Time for a story. Please enjoy our traditional Christmas Eve post. On a winter day more than 40 years ago, Louis Armstrong went to work in the den at his home at 34-56 107th Street in Corona, Queens, New York. 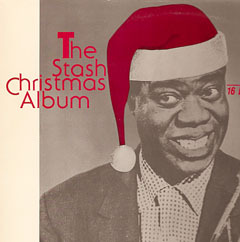 “The Night Before Christmas (A Poem),” Louis Armstrong, 1971, from “The Stash Christmas Album,” 1985. It’s out of print, but you can find the original 7-inch single (Continental CR 1001) on eBay. I found my copy when my friend Jim threw open his garage door and sold some of his records. I’ve since found another copy. It seems to be common. It was the last thing he ever recorded. 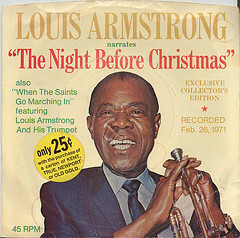 Satchmo died the following July. On this Christmas Eve, a post that has become a tradition. It’s out of print, but you can find the original 7-inch single (Continental CR 1001) on eBay for $10 or less. I found my copy three years ago, when my friend Jim threw open his garage door and sold some of his records. There’s no music. Just “Little Satchmo Armstrong talkin’ to all the kids,” reading Clement Clarke Moore’s classic poem in a warm, gravelly voice. It’s out of print, but you can find the original 7-inch single (Continental CR 1001) on eBay for $10 or less. I found my copy two years ago, when my friend Jim threw open his garage door and sold some of his records. It’s out of print, but you can find the original 7-inch single (Continental CR 1001) on eBay for $10 or less. I found it last year when my friend Jim threw open his garage door and sold some of his records. It’s out of print, but you can find the original 7-inch single (Continental CR 1001) on eBay for around $10. I found it earlier this year when my friend Jim threw open his garage door and sold some of his records.